I used to be a really good driver. I thought I was awesome and amazing. I learned on a stick shift. 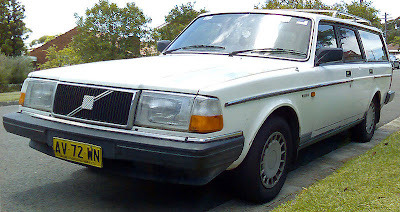 My first car was a Volvo station wagon. Except it wasn't as nice as this one. I moved on from the Volvo to a truck, then to a SUV. Moms in minivans made me CRAZY!!! Why can they never park!!! I thought that motherhood automatically made you forget how to drive. When I became a mom I still drove a SUV and I could rock any parking space. Parallel park in downtown LA? Back out of a tiny space, surrounded by Suburbans? I could rip up and down mountain roads without using my brakes. But then, we had another kid. Gas was five billion dollars a gallon. My dream of owning a Sequoia quietly died. Instead, we went with a more sensible minivan. As soon as I got the keys, I too forgot how to park. Or come within legal length of curbs. It only took one week for me to take out a pole. Two weeks to destroy the picket fence in our front yard. One month to do my worst to a shopping cart corral. for the school parking lot to clear. All with the hope that I won't demolish anything. Being a mom has not made me a bad driver. you cannot see the nose on a minivan. or very far away from doubling your insurance premium. then quitting and parking far away, have a little compassion. Because now I sure do. I am crying right now from laughing so hard at your post, and at Lo's comment as well! Thank you, thank you, thank you! I was an awesome driver until the minivan and since getting it I have burst a tire hitting a curb on the on ramp, hit the side of the garage door, and have sideswiped a parked vehicle. I love my mini-van...but admit that I used to say that I would never drive one! That is why I will never drive a mini-van! : ) I love my Jeep! I literally just snorted reading this. I am anti minivan - I promise to only point and laugh at you when you aren't looking *PROMISE*. I used to be anti minivan too. I always thought I would never be caught driving a minivan but we had our second child, the gas prices were outrageous and the safety features were too good to pass up. I have to admit...it's rather hard to see over the front end. Haven't taken out any curbs yet but my husband has! I just had to say 'AMEN!' to this entire post. I cannot count the times I have had to get back into my minivan and pull it more forward in the parking space because I can't tell how close I am. So annoying. But, I really do love the space I have in the van. I'm so there with you. I managed to run over a curb and snap off the running board on the passenger side. Which I then humbly got out, picked it up off the side of the drive thru lane and tossed it into the back of the van and drove off. I used to be a good driver (won't go so far as to say awesome) but good... then the gold beast came to be my vehicle and it's been downhill since! i drive a minivan. not by choice. Thanks for the giggle today...I have one child and drive a sedan. I will only go to a SUV or stay in a sedan. I will think twice before rolling my eyes at the minivans though. Too funny. Not only am I a SUV owner, but a Sequoia owner too. I heart my bit fat, gas guzzling SUV. My Honda Odessey van driving friend was very impressed that I could back my Sequoia into a small parking spot. I got her all impressed. I said it's all in the rearview mirrors, my darling, all in the rearview mirrors. And I can't parallel park to save my life. When I was 16 and taking my test, I must've tried 20 times or more to get into that spot. Finally the instructor just rolled his eyes and said, "Fine. We'll say you can do it." pffft. i can't see the nose on my car anyway. in fact, i'm so short that i can't see ANY of the hood of my car over the steering wheel. and i am an awesome driver. you can learn and gain your awesomeness back ! i just had to drive a minivan this week and i shouted "i can't see the front of this thing!!" while parking. that is too funny. i drove it and i hated it. stupid gas. stupid economy. i feel safe in my big SUV. in the van i feel like i will get smooshed. at least you aren't the mom who just gushes over the minivan....you gave in...just like i probably will have too sooner than later. I also gave in and got the sensible mini-van until I had too many kids to fit in it and then we got a big ol' SUV and I HATE IT! I mean I love it because it's big & I can fit all my kids in it and have them be safely buckled into their respective car/booster seats but I can't drive the stupid thing. I always park a million miles away from anyone so I can pull through and not have to back up. And I've hit my husband's truck - twice - while backing out of our garage. HA HA... as a mini van driver myself. I accept your apology ;).... Said I'd never drive one and then well.. never say never right? This made me laugh! You are so funny! I am one of those people who will never drive a mini van. Just can't do it. Can't be the soccer mom in the van. Ahh!! I just wanted to let you know that I gave your blog an award on my blog. I love reading your blog! I actually love my Odyssey, maybe it's my height but I haven't had trouble seeing out of it - I was more impaired in my friend's Expedition than my Odyssey! Too too funny! I drive an SUV but can't wait to get a minivan. I had no idea you an't see the nose in those things though. I can see know how all that would be tough. I'm still an SUV mom...however, squeezing 4 kids (three of which are still in some form of a car seat) into that SUV is getting to be a SWEATY feat every day!! I admit I stay at home days on end just to prevent going out and loading them all up...I'd rather stay home! I used to have a Pilot and man that thing could fit ANYWHERE and turned on a dime AND had one more seat... but there is no way I'd give up the room I have now in the van... I just wish they were cuter on the outside! hysterical!!! I have been a minivan mom for 5 years now. I havent had too many casualties, but I do hate backing out in the van. It seriously needs a back up mirror & one of those alarm things. And people need to be aware that you cant see out the back either.I dont even attempt parallel parking in that sucker. Thank goodness I don't drive a minivan. I have enough problems trying to park my Jetta. I admit I am a terrible parker. However, I will say that I do park within the lines, even if it takes me several tries. I laughed out loud to this! So hilarious, and maybe just a little bit true.